Spike, is an English rock front man, songwriter and vocalist most famous for his times with The Quireboys with whom he has released six studio albums to date. It takes some serious bottle (Jack Daniel’s, perhaps?) and a good deal of ambition to up sticks at the age of 17 and seek fame and fortune in the Big Smoke. But Spike has always boasted both in abundance. When the charismatic frontman formed the Quireboys in 1984 with songwriting partner Guy Bailey few predicted anything but a glorious failure for this quirky north-south alliance. Yet within six years the band was riding high with a number two album and Spike was confirmed as a major international star. It all seemed like a long, long way from those early days propping up the bar in Newcastle’s sweaty Mayfair Rock Club. But for Spike it all seemed so natural. 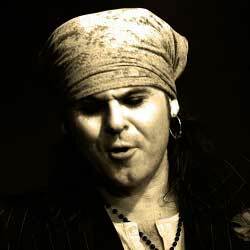 The face of the Quireboys for almost three decades, the bandana-wearing Geordie with a boyish charm has enjoyed a stellar career, criss-crossing the world’s biggest stages to critical acclaim. When Spike’s beloved band initially called it quits in 1993 – after a rollercoaster ride featuring big hits, heavy falls, Sharon Osbourne’s management and a slot supporting the Rolling Stones at Newcastle United’s St James’s Park – there was a fear one of rock n roll’s favourite new sons could call it quits. But the multi-talented vocalist popped up alongside Poison’s CC DeVille, and Dogs D’Amour stalwarts Darrell Bath and Tyla before delivering his 1998 solo debut Blue Eyed Soul. His chart-busting band spat out by the growing force that was grunge, Spike stayed strong. And in 2001 the time was finally right to reform the Quireboys. Within months it was just like the band had never been away. Reunited with long-time friend and guitarist Guy Griffin, Spike set about recruiting the core of a new-look act destined to redefine its glorious early-90s past. And if a revolving-door rhythm section has become synonymous with the Quireboys then the close-knit quartet of Spike, Griffin, Paul Guerin and Keith Weir has proved an invaluable constant. “It’s a line-up that does the Quireboys justice and it’s a line-up that’s here to stay,” said the band’s buoyant lead singer. “We’re very proud of the work we’ve done in the studio and on stage during the last decade. And there’s more to come. “The Quireboys is, and always has been, about having a good time and playing rock n roll you can sing and dance to. Recognised and revered as one of rock’s most endearing frontmen, Spike has evolved into the mature songwriter responsible for some of the Quireboys’ most evocative lyrics on brand new album Beautiful Curse. Currently putting the finishing touches to a deeply personal collection of songs celebrating Scottish singer songwriter Frankie Miller, it’s clear there’s much more to come from the genial Geordie with the Rod Stewart-esque rasp.